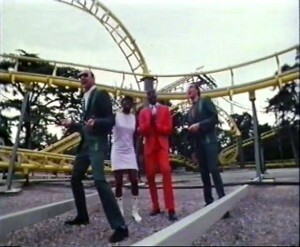 The first obvious difference in this edition is that instead of the top thirty countup, the show opens with a brief montage of some of the acts who will (or, in this case, won’t) be appearing later on, while Computer Game (Theme From The Invaders) by Yellow Magic Orchestra plays in the background, completely unannounced. The opening feels very slow, with around ten seconds given to each act, leading not so much to a sense of breathless anticipation as a check of the watch and perhaps a muttered “Get on with it!” Once that’s out of the way, Powell introduces the first act, “heavy metal at its finest” from Saxon, only there’s something a bit odd looking about Saxon tonight. Yes, because the Musicians Union is still on strike there are no musicians available to perform on tonight’s show (yes, ha ha, that’s why B.A. Robertson is on, very good). In their stead, various crew members and people who just happened not to be doing anything much have been brought in to pretend to be Saxon while their second top twenty hit plays in the background. Unfortunately nobody seems to have told them what they should do once they’re up there. The bespectacled “singer” looks like he was expecting to have to perform the similarly titled Frank Sinatra number and so makes a few vague attempts to open and close his mouth in time to the music, which looks even stupider than if he had kept it shut. Luckily the bloke to his right is clearly a frustrated axe god, so most of the attention goes on him. Best of all is the fella tentatively prodding at a keyboard in the background, an interesting addition to the display as Saxon didn’t have a keyboard player. Once “Saxon” have been put out of their misery, we are introduced to another innovation that would stick around for the rest of the decade – the name of the act displayed on screen as their performance ends. They seem to be experimenting with various ways of doing this, not that there would ever be a definitive method, so the band is slowly obliterated as “No 14 SAXON No 14 SAXON No 14 SAXON No 14 SAXON” is overlaid on screen in a seemingly infinite loop. B.A. seems unimpressed, bursting into Sinatra’s Strangers In The Night for a moment before going all unnecessary. Yes, for various reasons Odyssey aren’t here tonight, so… enter Limbs & Co! “It’s not much of a body but they can use it up and wear it out any time they like,” offers Robertson, reusing the gag Mike Read did about the Bodysnatchers last time B.A. was in the studio. Use It Up And Wear It Out was the second of five top ten hits for Odyssey and was hanging around at number 2 for a fortnight before giving the New Yorkers their only UK number 1. As the show isn’t going out on TV, clearly nobody has bothered to choreograph or learn a routine and the girls just wiggle around a bit, shaking their bodies down as per the lyrics… or maybe that was the routine. It’s hard to tell. After seeing off Limbs & Co, Powell foolishly asks Robertson his opinion of the new McCartney single. “Well, it’s slower than his last one,” he begins, and then dozes off during the second half of his own sentence. B.A. is certainly not wrong though, Waterfalls is significantly slower than Coming Up and is something of an overlooked entry in the McCartney canon, unless you’re TLC who definitely remembered it fifteen years later. (It’s slower than TLC’s song too.) Nobody wants to stand up and pretend to be fab wacky thumbs-aloft Macca, who almost certainly wouldn’t have done the show anyway, so we get the video which starts with him composing the song in his home studio, just as it happened in real life, although whether he wrote the song in such a hideous tank top is not on record. But suddenly Macca gets up from his piano, the walls disappear and there’s a fountain behind him! Not an actual waterfall, but beggars can’t be choosers. The fountain dies down and, without warning, he’s in the Arctic Circle! Or, more plausibly, somebody has left some white bedsheets lying around which looks great but must be confusing the hell out of the polar bear. 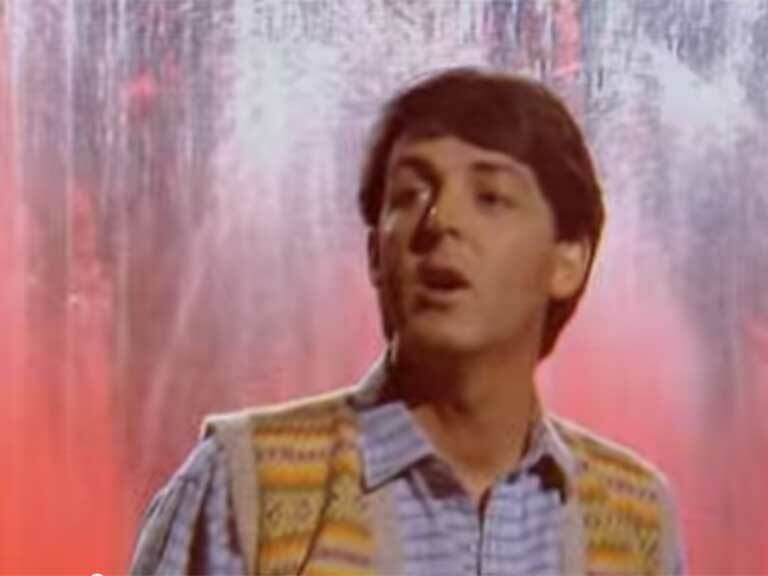 But then, before we know what’s happened Macca’s walking through the enormous back garden of McCartney Towers, complete with merry-go-round which he has a quick spin on before the sprinklers come on again, leaving him back in his studio. Paul McCartney is not on drugs, this really happened. 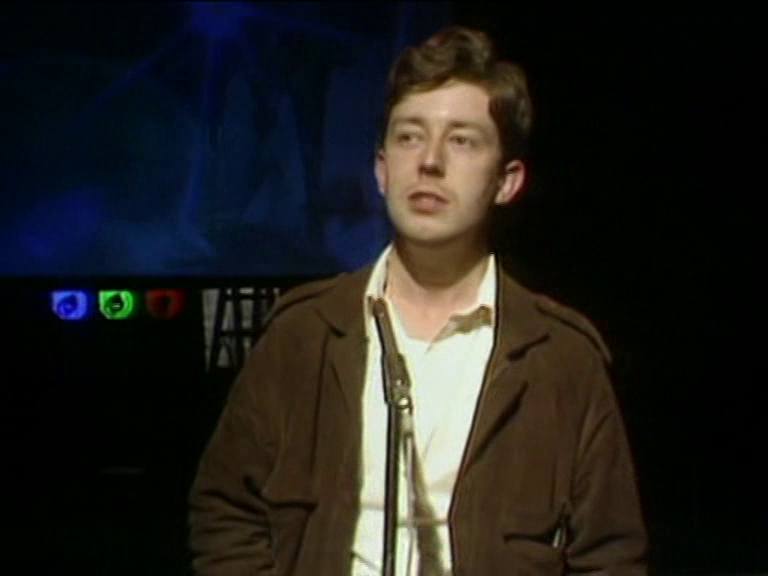 Back to reality now… well, back to the studio anyway, and Peter Powell in front of a large, very dim video screen which promptly goes blank and flickers a bit. No time to fix it though, as TOTP demands a chart countup and we haven’t had one yet. Now here it is, cut into three bite-size chunks of ten positions each and peppered throughout the show in a way that would become the norm for the rest of the decade and beyond. 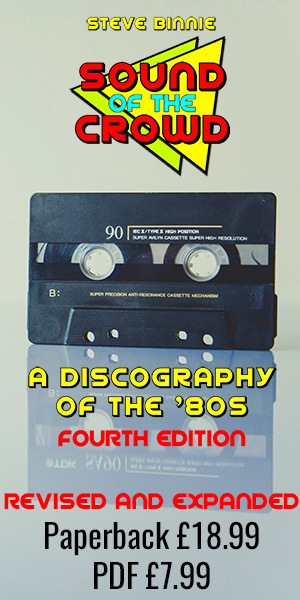 The captions are still the same as before, except for a new and terribly exciting graphic which illustrates whether a song is going up, down or nowhere fast, while the countup music sees the return of an old friend, Whole Lotta Love sounding reassuringly familiar in this frightening new TOTP world. Also familiar is this Thin Lizzy number which has been in the chart so long it was on the last pre-Event edition of TOTP six weeks ago and it’s still only climbed to number 21. Still, as the band were on the show we can just edit that performance in, right? Of course not, we’ve got another bunch of extras who don’t really know whether they’re supposed to mime or just fill the space where the band members would stand. Extra marks for the time-honoured yet always surprising drums-at-the-front stage layout and a Phil Lynott stand-in whose neatly trimmed hair and moustache suggest what Lynott might look like if he were still with us today. Worrying scenes as B.A. Robertson engages threatening Glaswegian mode: “Phil Lynott and the Lizzies down in Chinatown, but would you let your sister go with them?” he asks Powell. “No way!” squeaks Pete, anxious to play along and too scared to tell him that he doesn’t have a sister. We move on with Leo Sayer, who of course isn’t really Leo Sayer but one Mike Martin. As the only stand-in soloist on the show, he realises pretty quickly how stupid he’s going to look just standing there for three minutes and decides to start lip-synching to the song. Fair play to him, he does a decent job for someone who doesn’t really know the song, as well as having the air of a young Rick Astley; he even gives the camera a knowing look at the end of his performance. More Than I Can Say became the last of four number 2 hits for Leo Sayer; his first seven hits all reached the top ten while the eighth, Thunder In My Heart became a belated number 1 in 2006. Sayer now lives in Australia and released his latest album Restless Years in 2015; Mike Martin doesn’t seem to have released any records but was good enough to take part in the BBC’s documentary Top of the Pops: The Story of 1980. After the second instalment of the top thirty, which includes B.A. Robertson’s To Be Or Not To Be falling to number 12, we move on to the highest new entry via the new and now working again video screen. “The face you see behind me, the voice you’re just about to see” – that needs a bit of work, Pete, but we know what you mean. Clearly nobody was prepared to pretend to be Kate Bush either (although Mike Martin might have had a decent shot at it), so here’s a video clip we made earlier: not the familiar promo video though, but a clip from – can this be right? – Makin’ Love and Music, a Dr Hook TV special from back in April which Kid Jensen warned us about at the time. Kate’s doing one of those routines that involve two costumes split in half and joined down the middle – sensible Kate in profile from the right, dangerous shiny adulterous Kate on the left. Babooshka would become Kate’s biggest hit since Wuthering Heights and until Running Up That Hill five years later; with the help of a proper TOTP appearance it might have made it all the way to the top. After a brief introduction in which B.A. 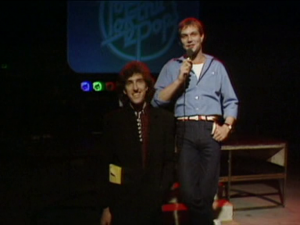 auditions for Give Us A Clue by miming the next band and song title, we’re onto the last chart gasp of one of the great TOTP Twitter talking points of the past few years. 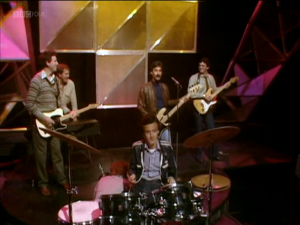 Darts have been polarising opinions on social media since their first TOTP appearance back in 1977/2012, with the lunatic antics of Den Hegarty and the suggestion that various members of the band look a bit like Peter Capaldi and/or Armando Iannucci sparking all sorts of baffled tweets. Despite scoring three consecutive number 2 hits in 1978, Darts’ appeal waned after Hegarty’s departure and this Four Seasons cover would be their last top forty hit. The video sees them fannying about in Alton Towers, standing in front of – and later riding on – the infamous Corkscrew which at the time was the most extreme rollercoaster in the UK, so of course they would have had to hang on. D’you see? Darts’ video director had clearly borrowed the Flick Colby Big Book of Literal Interpretation while the show was off air. It’s a shame The Event deprived us of a final studio appearance for the group, although Hegarty would return to our screens the following autumn as a host of the final series of Tiswas at much the same time as Barry Manilow’s cover of Let’s Hang On became another top twenty hit. Before the number 1 we’ve got to get through the top ten countup, and by jingo if they haven’t messed with that as well, giving us a brief clip of each song in the top ten, even the ones that are just accompanied by a still picture of the artist. Such a shame they didn’t get someone to pretend to be Splodgenessabounds. 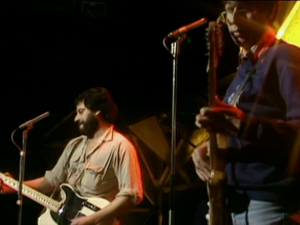 So we come to the number 1 and perhaps the greatest (Dave Lee) travesty of The Event: the fact that ELO are robbed of their only chance to appear on TOTP as chart toppers. 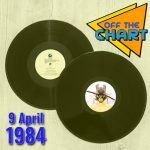 Despite having scores of hits through the ’70s and well into the ’80s, Xanadu was the only one to reach number 1 in the UK, and how does practise TOTP illustrate it? 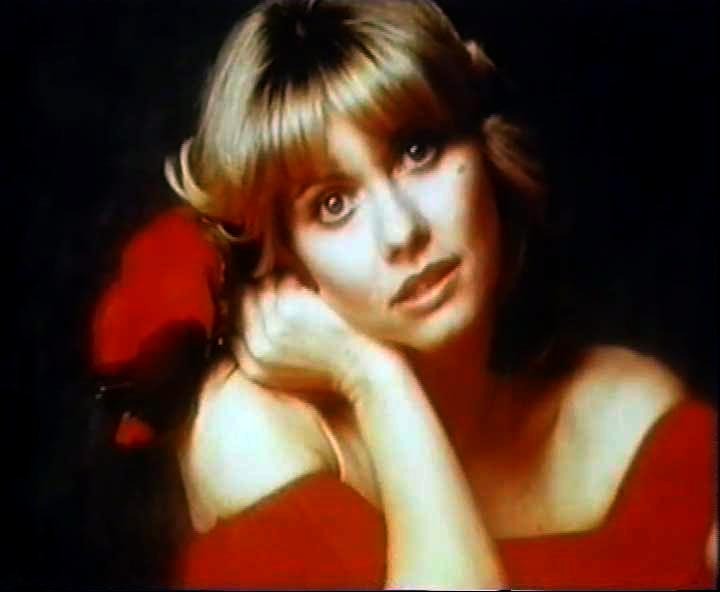 With a still photo of Olivia Newton-John who had already spent most of 1978 at number 1 with John Travolta. A still photo, mind, even though it moves around the screen very slowly like a half-arsed screensaver. Behind those shades, Jeff Lynne must be fuming. B.A. Robertson isn’t too happy either – “You didn’t even get a chance to sing,” taunts Powell; “And my record went down!” B.A. sobs. “See you next week,” Powell offers with misplaced optimism, before giving Robertson a friendly pat on the shoulder which sends him tumbling head-first off stage as the credits roll over A Lover’s Holiday by Change. Never mind, B.A., you’ve still got another hit to come and you might even get to present a proper edition soon if things get really desperate.